After missing the launch weekend of the Monkey Trail at Cannock due to being in Wales, I was keen to get out and give the new Trail a good seeing too, Just my luck the sun decided to disappear for the afternoon! This is one trail that I have been eagerly awaiting for the about a year now. 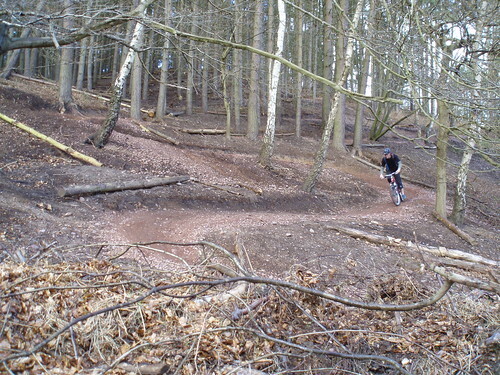 Cannock is probably the closest Trail Centre to me so the prospect of a new trail at the place where I ride most often was all too much to wait for. The new trail takes in most of the existing Follow The Dog trail, branching off shortly after the fire road climb on section 8, taking a sweeping line through the trees to the first major downhill section which features several tight switchbacks and a stepped corner, all requiring a high level of skill to clear. This section sets the scene for the rest of the trail – you know straight away that this is not going to be an easy ride; this is a trail that is going to test your technical abilities. After the first downhill, the trail crosses the railway and the A460. Apparently the train drivers are well aware of the crossing and slow down making all aware that they are approaching, but the road is another matter. The A460 is a very fast road and caution should be taken when crossing. We are all adults and should know how to cross the road by now, but you just get the feeling that there is an accident waiting to happen here. Once over the road you hit the first climb, and what a climb. It’s a steep loose singletrack climb with some tight switchbacks. 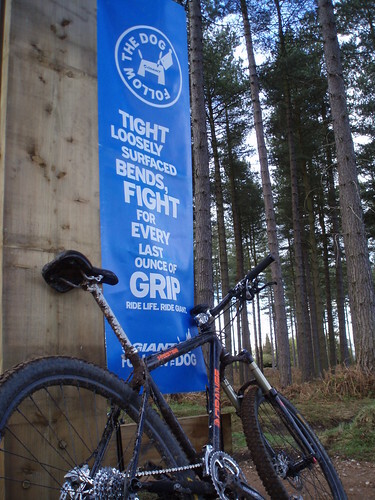 There is plenty of grip but it takes plenty of energy to power up the ascent whilst carefully negotiating the corners. Once at the top though, the trail opens out into a fast flowing section which you can push and really get into the grove. This section ends at Klondike Bridge, the first of many wooden features that are scattered around the trail. This bridge leads you onto the next climb, one that reminded me a little of a mini Afan Wall style climb. It’s a nicely cut bit of singletrack climb that takes you back up into the forest, again featuring tight switchbacks to keep you honest. If there were a few more rocks scattered around I could have sworn I was in Wales at this point. The trail then just keeps coming with more sweeping singletrack, epic descents featuring large berms and cleverly positioned jumps, all followed by more well thought out climbs that effortlessly deliver you back to the top for another descent. 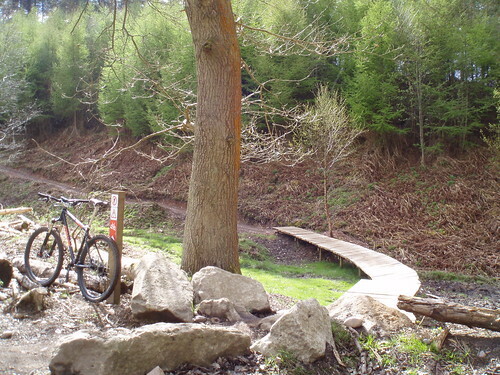 This really is a nicely built trail, but one that will probably deliver the more gung ho riders straight to A&E if they don’t respect it, as there are many tight tree gaps, cheeky drop offs and speed inducing berms which are all tempting you to push that little bit too far. This is a trail that will help develop and hone your skills, making you a better rider, but just don’t push the Monkey too much... it may just bite back! All too soon, even though it is a fair distance, the Monkey is over and you are delivered back to the main road where you cross back over to rejoin Follow The Dog. You might be rejoining the old trail but there are still a few surprises in store. As you reach the legendary Chainslapper section you are greeted by a load of brashing blocking the trail and signage directing you over the road to the new final sections of the Dog. This is a part of the chase that I have only ridden a few times before and I didn’t recognise it at all. Chase Trails have sculptured a fantastic flowing singletrack section that runs parallel to the road all the way back to the visitor centre. 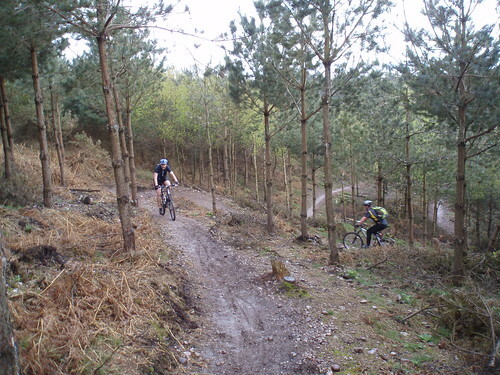 This section known as Tackeroo is a truly awesome way to finish off a ride which has now raised Cannock into the premier league of UK Trail Centres. Follow The Dog was always a great Trail, but it’s relatively short distance and overcrowded nature meant that it was constantly in need of maintenance resulting in days when you were riding diversions around some of the best sections. Now with the Monkey doubling the number of kilometres in Cannock’s trail network, there is far more on offer to make a trip over to the Chase a no brainer. My only concern is that after only a week of riding there are a few sections that have already started to develop braking bumps. I hope that this is just down to the amount of traffic due to the trail being new and that the sections affected will bed in over time. 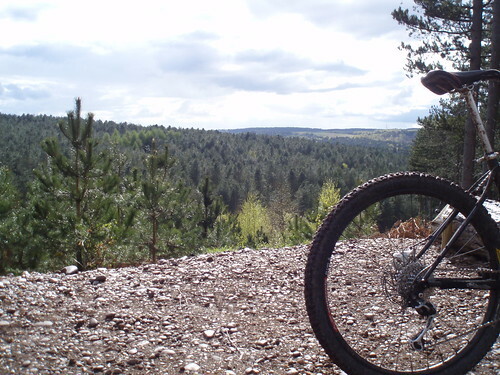 Overall Chase Trails and the Forestry Commission at Cannock Chase have done a fantastic job of creating a trail that is worthy of making an extra effort to go and ride. They have managed to carve some fantastic singletrack out of an environment that does not have a great amount of elevation, making the most out of what they had to work with. It is testament to the hard work put in by the volunteers who have given their time to create something special. They should be thoroughly proud of themselves. In conclusion the Monkey is a trail that is going to take time to master, with built in features that will challenge you, and ultimately push you into being a better rider. I’ve ridden many trails up and down the country, and I never expected a trail in Cannock to rival the best that the UK has to offer, but the monkey does a bloody good job. I’m already planning my next visit; there are some switchbacks that I need to master!! !